Media and Contents: Soft cover, 80 pages plus IS Series color guide. 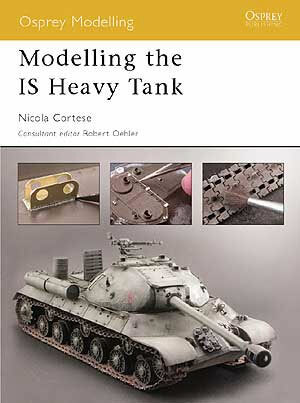 The latest in Osprey's new Modelling Series is "Modelling the IS Heavy Tank" by Canadian modeller Nicola Cortese. The Iosef Stalin series of tanks were the first Soviet vehicles to successfully confront the German Panther and Tiger tanks on a one-on-one basis. Entering Soviet service in 1944, The IS tanks and their tank destroyer derivatives toiled into the 1960s and 1970s in foreign forces. All the projects are lavishly illustrated with excellent progress photos. These photos are helpfully captioned, and focus strongly on describing the many construction, painting and weathering techniques used. There is a good mix of after-market and scratch built enhancements to the models. The book concludes with a summary of references and websites; plus a single-page colour chart showing some of the commonly used paints used on the IS family. I enjoyed the focus on techniques, the high-quality photography and the impressive standard of modelling in Osprey's "Modelling the IS Heavy TankTank". This title will be very useful to modellers of Soviet vehicles in particular, and armour modellers in general, whether you work in small scale or in 1/35.